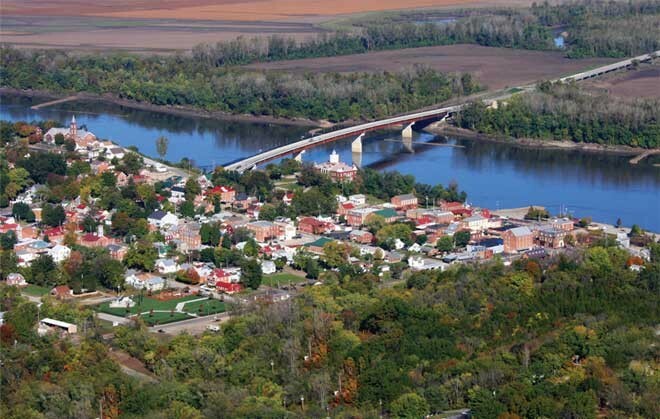 The flood site depicted here was Hermann Missouri, an old family town right on the banks of the Missouri River. This city is not just susceptible to flooding due to its close proximity to the Missouri River but also because it has another water source, Frene Creek, that rows through the middle of this small town. Nearest to these to bodies of water are the River Front Park and Hermann City Park which both flood very often due to the low altitude and distance from these water bodies. The townspeople of Hermann do understand the risks and challenges that come with living in such a frequently flooded area. They have gone over the best places to evacuate given a flood, they are told which roads will flood first and to plan their routes accordingly if a flood is happening, they have changed interior features of their households in order to cooperate and make it easier to repair water damage, and they know how to move items from their businesses to best save their assets and open back up as soon as possible after the floods. They have a lot of systems in place in order to preserve their tourist industry when flood season starts. They understand that being on low ground near bodies of water puts them at risk of flooding, but they take preventative measures to ensure their towns success.